Should America Subarm its Citizens? There’s a point between fully armed and disarmed that is subarmed. Being subarmed is dangerous. Officials would never stand for it themselves. It’s the point where you don’t have a very good gun, or certainly not the type you’d prefer, or not the type your police prefer for their own safety, and not the right ammo, or certainly not enough of it. It isn’t the caliber you want, and the magazine is too small. You’re subarmed. It seems there are people at work in the government and the euphemistic gun-control movement who have figured out if they can’t disarm the public -- because the public will not stand for it and put up intense opposition -- they can subarm the public (that’s you) a little at a time. If you’re subarmed, and they’re fully armed, that’s pretty much victory for them and a shift in control. Because it happens by bits, the big picture is obscured. Little by little the power shifts from the public to the authorities. We used to have parity with government, and this kept government in check, made America the liberty capital on Earth. We the people were equal with our hired hands. Both sides were in a state of stasis, equilibrium. They had matchlocks, we had matchlocks. They had flintlocks, we had flintlocks. They got cap and ball, we all had it. We grew up together, we were partners in this, developed the field together. Self-contained cartridges, rifled barrels, bolt action, revolvers, semi-auto, improvements to everything, optics, full auto... the story starts to rag out right there. In 1968 our employees in government decided it was time for us to fill out paperwork for any gun purchased from any manufacturer. It’s been that way ever since, despite the enormous trash piles generated by “news” media to the contrary. It’s no big deal -- maybe -- but every gun made and sold legally to an American since then comes with government paperwork. Twenty-two years later, in 1986, the scales of equality tipped over. The Gun Control Act basically said members of the state could have machine guns but the peasants (that’s us) could not -- only one-shot guns for us. Matching firepower was no longer for the masses -- it was for the hired help only. Two centuries of Gun Equality between government and the public was over. Now that’s a big deal. Oh, the few full autos in public hands at the time could remain, but this was subarming on a grand scale, an order of magnitude, it made the two sides totally unequal. The miniscule number of now collectible machine guns people owned could be cherished, lost to wear-and-tear and jealously safeguarded -- thanks to five-figure price tags instantly springing upon a closed finite market. The rapid decline in freedom everyone has been noticing was catalyzed. The rise of the police state became more intense. SWAT raids (multiple battle-equipped specialists with machine guns and overwhelming power) have gone from 3,000 per year in 1980 to as many as 80,000 per year now. The Andy Griffith Show was solidly in the past. Officer Friendly was on his way out. We weren’t a police state then and we’re not one now, we’ve just started looking more like one than anyone would like -- and toe the line, pal. Not to worry, our morals are still intact. Or are they. You’re overwhelmed when a dynamic entry team of eight masked, body-armored men storm through your door with flash-bang grenades at two in the morning, like the state does these days. You’ve been subarmed to the point of being gunless when they have MP-5 machine guns and you have the civilian single-pull-of-the-trigger AR-15 you’re so proud to own. It's the gun you insist is OK because it’s the one-shot model, not the machine gun it looks like, which ignorant gun haters fear it really is. And they want to confiscate that too. 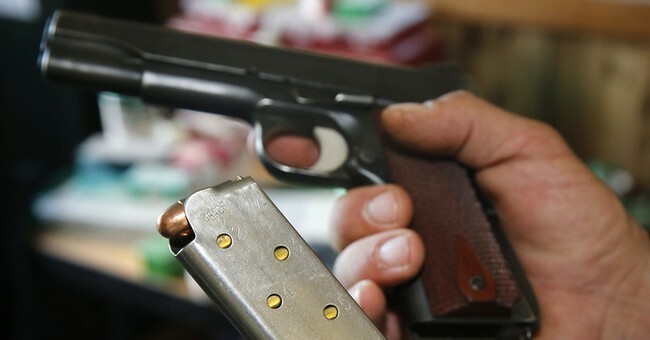 The seven-round magazine New York got saddled with is a subarmament joke and the people responsible should be brought up on charges for infringement and violation of oath of office. They swore to uphold the Second Amendment, not to find workarounds. Small magazines endanger the innocent when peril lurks. Ask police if they would stand for that. Meanwhile, BATFE bureaucrats are deciding some ammunition is more dangerous than other types, so it should be banned. How utterly preposterous! What needs to be banned is the BATFE. Ammunition cannot be banned based on the fact that it is dangerous! And a government agency cannot exercise power that Congress has no legitimate delegated authority to give it. Using any type of ammunition at all in any unjustifiably dangerous way is already grossly illegal many times over at every level and can carry the death penalty. Murder is illegal. Attempted murder is illegal. Planning a murder is illegal. Using any kind of gun and any kind of ammo for any of that is criminal at the state and federal level with no wiggle room. That’s enough for this rogue agency or any other. Banning ammo is an infringement ploy. If authorities can justify subarming the public based on ammo type, the Second Amendment will have been eviscerated, and this is intolerable. All subarmament efforts should be spotted, called out for what they are, and summarily halted. There are no excuses, no saturation “news” stories about crazed maniacs that justify taking action against the public. The responsible parties should be reprimanded, discharged from or voted out of office and publicly ostracized for acting against the interests of the United States. The jig is up.